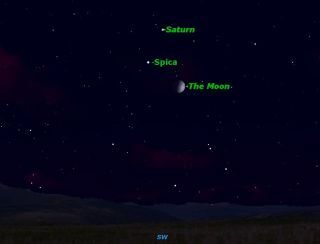 Saturn joins the bright star Spica and the first quarter moon on Wednesday June 27. As the moon makes its 29.5 day journey around Earth, it has regular close encounters with planets and stars along its path. In recent weeks our satellite has passed close to Venus and Jupiter (June 17), the sun (new moon, June 19), and Mercury (June 21); this week it's Saturn's turn. On Wednesday night, June 27, the moon will be one day past first quarter as it cruises just south of the planet Saturn and Spica, the brightest star in the constellation Virgo. The days around first quarter are always the best for observing the moon because the terminator, the line between dark and light where the sun is rising on the moon, is perfectly placed to highlight many of the moon's most interesting features. Saturn's rings are made up of small fragments of rock and ice, so close together that they appear uniform from our vantage point. They look solid, but that is an illusion, as we have learned when a star passes behind them: The star continues to shine through the rings undimmed. In a telescope, see if you can spot Cassini's Division, the thin dark line which divides Saturn's rings into a brighter inner ring and a duskier outer ring. Look for the shadow of the planet on the rings, and the shadow of the rings on the planet. Saturn's moons are a topic in themselves. No one is quite sure exactly how many moons Saturn has, because many are tiny and hard to keep track of. Titan is one of the largest moons in the solar system, the only moon with a substantial atmosphere. It is readily visible in even the smallest telescopes. Larger telescopes will show Rhea, Tethys, Dione, and Iapetus. Because most of Saturn’s largest Moons follow orbits in the same plane as the rings, the moons can be located in any direction, unlike Jupiter’s moons which are always strung out in a straight line east and west. Use a planetarium program to identify the individual moons at the eyepiece. The star Spica is one of the gems of the spring sky. Just to its right is the lovely double star Porrima, Gamma Virginis. For the last several years Porrima has revolved to a point where the two stars were too close to separate even with a powerful telescope, but now it has opened up so that it can be split with a 6-inch aperture scope.